When you ask anyone to name animals in Alaska, answers run the gamut from wolves to whales and occasionally the erroneous penguin. But there’s one animal that hardly ever makes the list: sharks. The revered–and often feared–fish are usually the last thing that comes to mind when you think of Alaska. But Alaskans need look no further than our own chilly waters to find several species of the formidable fish. Cindy Tribuzio works for NOAA at the Auke Bay lab. She’s been researching sharks for more than a decade. It was originally Alaska’s more adored sea creatures that drew Tribuzio to the water. She says Alaska is home to three main species of shark including the Spiny Dogfish, the Pacific Sleeper shark and the Salmon Shark. And sometimes even great white and blue sharks are spotted stealing fish from lines and tangling up nets. The Spiny Dogfish is a small shark that grows to about 3 feet long. 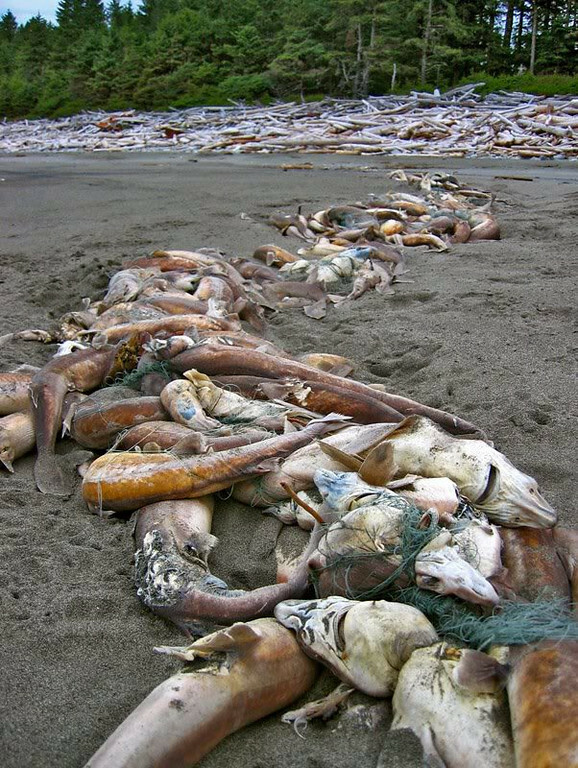 It often turns up on beaches or in nets, particularly around Yakutat. Dogfish also appear in Haida and Tlingit stories and artwork. 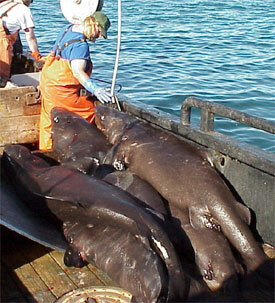 The Pacific Sleeper is a much larger but more elusive shark that reaches lengths of 10 to 12 feet. They’re a dark, sluggish fish that often aren’t seen until they get hooked on long lines or scooped up by deep nets. The salmon shark is perhaps the most familiar Alaska shark. Most common in Prince William Sound, these sharks look like smaller versions of their cousin the great white. None of these species are targeted for commercial fishing, but there is a small charter fishing industry for salmon sharks. Alaska Fish and Game biologist Dr. Ken Goldman has been studying sharks in Alaska for decades and the salmon shark in particular. Goldman says the salmon shark’s ability to maintain body temperature means it is capable of hunting a diverse range of prey, more than 30 species in fact, including fast swimmers like salmon. Goldman uses satellite tags to track the sharks’ movements around the Pacific, accelerometers to study swimming speed and dive patterns, and builds energy models by putting temperature tags in their stomach and muscles. Goldman says though sharks have been in Alaska waters for tens of millions of years, not that much is known about them. 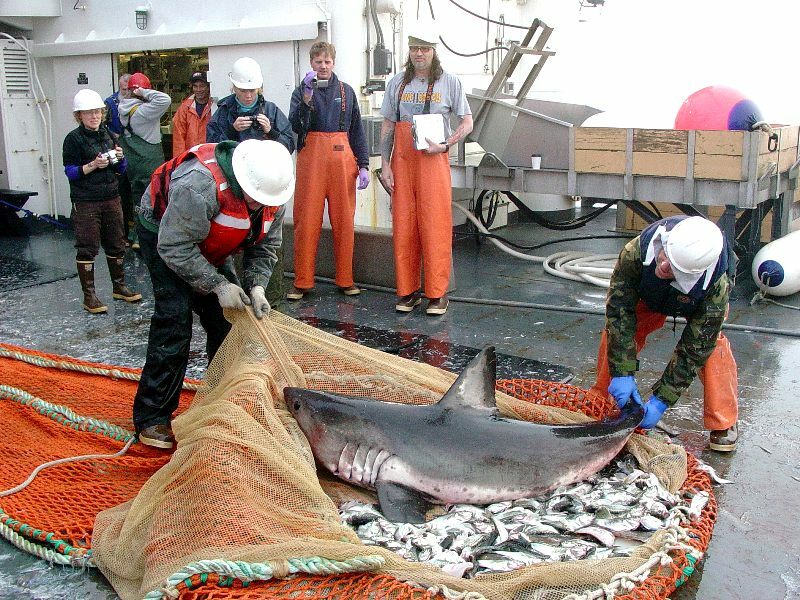 While few people are doing shark research in Alaska, NOAA’s Tribuzio says the number is growing. Dean Courtney has been a researcher with NOAA for 15 years. He’s building computer models that create a realistic range of life history and commercial by catch rates to infer whether the current sleeper shark by catch is sustainable for the population. Courtney is currently conducting shark research in Florida; he says he encounters people all the time who are surprised to hear that Alaska has sharks. 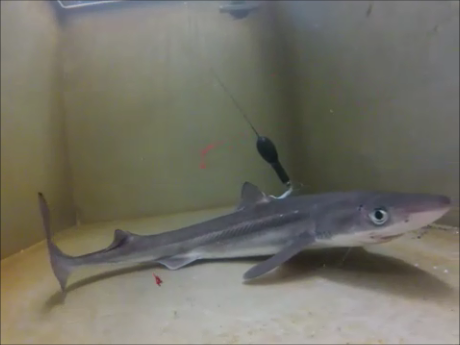 After 12 years working with spiny dogfish, Tribuzio says she’s used to it. 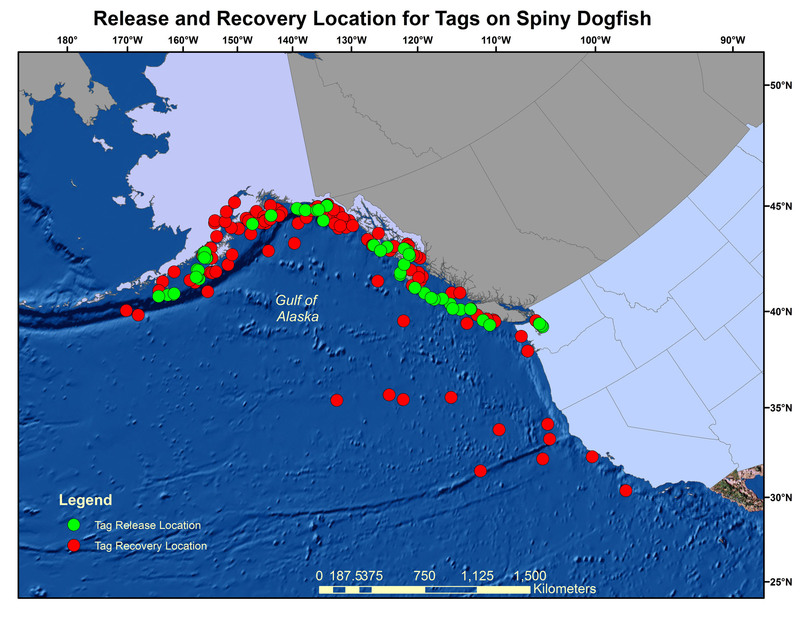 Although Alaska waters have fewer sharks, Goldman cautions taking them for granted.